This morning I had jury duty. I was summoned to the Framingham Courthouse to, as it turned out, watch a video and be sent home again. While I was not particularly looking forward to missing work and having to rearrange a bunch of kid-related carpools and other events in order to serve, I was kind of disappointed not to be able to get out of my rut and do something completely different--to administer justice. Another thing that has been not happening this fall is my violin blog. I really don't think my absent blog has much to do with perfectionism on my part . . . anyone who has heard me play or read my previous blogs is likely to realize that I'm not a perfectionist. But I can and do get out of the groove, and that has been dangerously close to happening to me, not just for jury service, or blogging, but also for playing. I wanted to post the poster even though the concert is over because it's so pretty. Especially for an amateur group, we have some of the nicest publicity fliers I've seen. A member of the cello section donates his time and efforts. And, the poster lists the program, which I suspect may be at the root of some of my unrest. 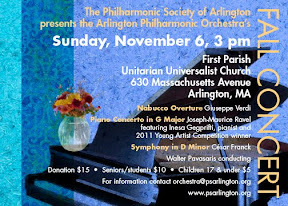 In this concert, we played two French pieces, the Ravel Piano Concerto in G, and the Franck Symphony in D Minor. The Franck Symphony was chosen for this performance by our orchestra's longest-serving member, Phyllis Spence, a 95-year-old woman who served as concertmaster for many years and who is something of a Franck fan. After 77 years, this was her last concert with the group and the conductor wanted to honor her by allowing her to choose one of the pieces. Composed in 1888 and premiered in 1889, this piece was relatively new when Phyllis was born in 1916. It's closer to Phyllis than, say, the Beatles are to today's conservatory students. And the Ravel concerto. That piece is younger than Phyllis. The North American premiere by the Boston and Philadelphia Symphonies took place in 1932, one year before the Arlington Philharmonic was founded. Both of these were new to me for this concert, and both were challenging in ways that were not straightforward to address. One approach I sometimes take to learning new orchestral music is to do a little reading about the pieces. In this case, wikipedia was my friend. I learned that both of these works were composed and premiered after 1850, which seems to be a personal line of demarcation, a time after which I am no longer guaranteed to like the period's orchestral music. I also learned that during this time and place, the symphony was considered a German art form and was therefore out of favor in much of France in the aftermath of the Franco-Prussian war. That Franck dared to write a "German" symphony caused much controversy and consternation among different factions of the Société Nationale de Musique. I felt bad for Franck, reading some of the negative reactions his symphony elicited. Yet, my feeling bad for the composer wasn't really the point. My violin teacher, too, had some ideas when I brought my part to her for help with practicing. "The world was getting noisier by then," she said. "More chaotic, busier. There were trains and carriages going by outside his window. This is what the world sounded like to him." That helped. Since playing a movement of the Franck violin and piano sonata last spring, I've tended to associate Franck with storms and water. There's a particularly wicked part in the sonata when the piano is pounding away like the ocean surf and the violin comes in, loud and high, like a seagull diving for a particularly tasty fish. And then both of them get caught up in a tidal wave that crashes onto a beach, and then washes, with relief and joy, back out to sea. The symphony has water too. But rather than a playful seagull violin playing on its ocean, it has a large steamship crossing it with purpose. Not the Titanic or anything, mind you (or at least I hope not). . . but a ship, large and noisy and industrial. And beautiful and awe-ful, like the trains. And the soloist for the Ravel was a complete delight. Her enthusiasm and professionalism were infectious, and she had to be careful not to leave the rest of us in the dust while still adhering to a lightning fast tempo, a line she toed with grace. She delighted the audience and gave them their money's worth and then some. Still, rehearsals for this concert were among the most difficult I've had with this orchestra. Last winter after several snowstorm-related cancellations, we had a Saturday morning rehearsal the day before the concert. This was productive, and the lesson was taken to heart. Long before the snow started falling, a Saturday rehearsal was scheduled for this concert too, which we desperately needed to avoid the icebergs. Even the day before, we were still working out tempos and transitions. I wish I could tie up the experience in a neat package, and say, "this is how we rose to the occasion," but that wasn't what happened. It was all these little things: the soloist's enthusiasm, the extra rehearsal, listening to recordings on YouTube, lessons, and lots of practicing. But I still want to pause and offer this blog about it, however imperfectly, before the holiday season starts with its Bach and Brahms and Handel. We were all summoned to stretch ourselves, to be a little better musicians than we were before. Karen, I laughed out loud when I read your comment about Franck reminding you of storms and water. I still have clear memories of watching a science film in high school where the soundtrack used large chunks of the Franck symphony. Subject of the film: thunderstorms! I can't hear that symphony without getting the visual image of huge, towering thunderheads, rain, and wind. The other thing about playing it is Franck's love of changing key every few measures, from six flats to five sharps and back again, with as many accidentals as possible thrown in. Yes, sharp- and flat-heavy key modulations were familiar from the sonata too. My teacher said it was a way of creating musical excitement and suspense. (As well as creating "excitement"--or is that anxiety?--in the players). What kind of orchestra is the Arlington Philharmonic? Is it a professional orchestra? Paul, no it is not a professional orchestra, it is a volunteer community orchestra, part of the Philharmonic Society of Arlington. The conductors are professionals, though, and sometimes we hire professional singers as soloists for joint concerts with the chorale. We also have a Young Artist's competition with an under-18 category and an under-30 category. The piano soloist for this concert, Inesa Gegprifti, was this year's under-30 winner.